In less than two miles I was in two worlds. Tuesday started with my neighbors and I watching a house get destroyed. The house across from me, next door to my neighbors has been vacant since I moved onto Bachtel Ave. 2 years ago. My roommates and I joke that there are more rocks from our driveway on the roof and through the windows of that old, abandoned house then there are rocks remaining in our driveway. And it was an eyesore. And it was a home for animals (raccoon and possum). And the foundation was bad (or so I was told). And the copper piping had probably long been stolen already. But this being the third house torn down over a five day period on Bachtel alone was still disheartening. It's a brown-dirt scab on an already injured street. I thought of Lamentations 1 "How deserted lies the city, once so full of people! How like a widow is she, who once was great among the nations! She who was queen among the provinces has now become a slave. However, my afternoon was spent at the University of Akron in a conference hosted by the Knight Foundation entitled "For the Love of Akron." We spent the afternoon designing shirts that captured the heart of Akron, perceiving the city through different eyes, and proposing plans to renew the city through art and civic leadership. It was good. But made for a weird day. My morning spent watching a house razed. My afternoon spent dreaming about the future of Akron. The contradiction was obvious to me and weighed on my spirit. The present reality of my city didn't match the desired future. And as encouraging as the conference was, my present concerns were left unanswered. However, I doubt that the city or the Knight Foundation would even be able to answer my lament. I understand most of the economic and political issues at work in my neighborhood. Its easier to 'landbank' and reinvest into a neighborhood later. Not many of my neighbors vote or attend community meetings for change. 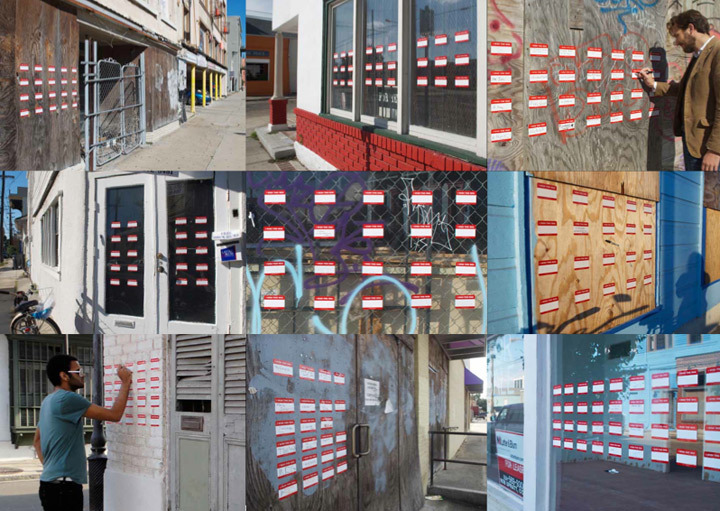 The stickers were posted all over New Orleans to express hope, despair, frustration, and potential. I wish my street were full of good neighbors and not empty plots. I wish there was a grocery store in walking distance. I wish the school on the top of the hill wasn't unused and vacant. I wish my street were a little more like Isaiah 58 and a lot less like Lamentations. I can remember talking about nonviolence and pacifism at a coffee shop. I remember the debate over the theoretical question, "what if someone broke in your house and threatened your family?" I was 20, single, and relatively safe. The notion of someone breaking into my not-yet real house and threatening my non-existing family wasn't even a present reality. I look back at the conversation in disgust now. Because it so trivializes the real hurt and pain and loss that so many have actually felt. An 11 year old girl was hit by a stray bullet this week. She died soon thereafter. She had been a participant in South Street's urban gardens last year. Some of her extended family are still gardening participants this year. I did not know the girl personally, but the weight of violence has burdened my heart this week. so much so that the hope of peace seems distant. It is easy for me to turn the other cheek, I've never been hit and I don't fight. But how do I tell children about peace when fighting is all they know? Sometimes, it feels like I don't practice nonviolence, but non-activity. Peace is easy when there is no conflict. "May those who love you be safe. and security within your homes." I am convinced that there is not much I can do to change my neighbors outlook on peace and violence. But I know that I know that God does change hearts, redeem cities, and establish peace. Pray for the peace of Akron. An interesting phrase for a sneeze. An even more interesting word and premise, blessed. Jesus doles out blessings quite interestingly, blessing the poor, the mourners, the persecuted, and the peacemakers in the Sermon on the Mount. But for us (at least for me) living in a wealthy nation, with a consistent paycheck, good friends, daily meals, and a solid family, blessedness can take quite different forms than what Jesus dictated in Matthew 5. Because blessings should be associated with happiness, right? Blessings should be connected to a good life. And I am not writing to posit that this isn't true. I merely want to share how I have been blessed in recent weeks. At South Street, we strive to employ urban youth. To teach them job skills and financial management that will equip them with opportunities as they enter adulthood. We do this on a small scale, hiring 2-3 youth at a time. One particular young woman is bright and witty, with a razor's tongue that keeps the neighborhood entertained and ensures her protection against the insults of others. She frequents our programming and also attends events with other Akron non-profits. At one such event, this young woman lost her temper as a situation spiraled out of control and our newest hire ended up verbally and vulgarly dissecting the staff of this organization. Needless to say, we heard about it. So we talked. We put stipulations on her employment based on her reconciliation with this organization. They didn't need to be friends, but they needed to respect each other. And this mediation came to pass, and it went well (for the most part…). So where does blessing come in? How was I blessed by this whole situation? Frankly it was more work for me and a bit more drama than I care for. But in between the situation and the mediation, this student asked me for some help with one of her school assignments. Poems for English class. And I was blessed. Blessed to be a neighbor, friend, and brother in Christ close enough that this young student currently on some form of probation felt comfortable enough to not only ask me for help, but to let me read her poetry. Poems of a descriptive personal nature, detailing her temper, her facade, her inner quietness. It was a blessing to be let in. To be invited into her life and to know her a little deeper through her words. Her words defend her in a rough neighborhood. Her words entertain others and esteem her place in the pecking order. Her words defend against racial and economic differences. Her words can cut you to the core. Her words were a blessing to me. I am not going to post her poetry her. One because I do not have her permission (although I may ask later) and two because it is her story to tell, not mine. Mine is to share her blessing. Not a blessing of wealth, family, or comfort, but a blessing of depth. Depth of character, story, and shared-life. I am blessed to be welcomed into the heart and life of another. I hope that in my words you find a blessing as well. At South Street, I often work with volunteer groups. This may be one of my favorite aspects of my role there. I feel a kinship with most volunteers, knowing that volunteering has been such an essential part of my own urban experiences. I also get to share some of the theology and theopraxy of South Street with the volunteers, a conversation I generally enjoy having (and a soapbox, I seldom avoid). This week a group asked me about downward mobility. Before I expand upon my thoughts, let me introduce some background definitions. Upward mobility is a socio-economic idea of moving up social and economic classes. It is one's ability (whether intrinsic to that person, as in naturally athletic or intelligent, or circumstantial) to move up and out of own's present circumstances into a 'better' life. Many would associate the idea of upward mobility with the premise of the American dream. However, the group asked me about downward mobility. Downward mobility, from the questioner's perspective, is the notion of forsaking one's natural 'success' for a life 'below one's means.' This question is derived from the South Street story. Duane, haven given up a middle class job, for a life of pastoral work in a predominantly lower class neighborhood embodies this notion of downward mobility. And it was at this point, that my normal paradigm began to shift. A year ago, I would have signed on to the notion that downward mobility was a good thing. That forsaking my chances for economic success in exchange for a life of service was the way to go, however I find there is more to it than that. And the more to do is this idea of privilege. I have stated above that mobility is connected to one's ability, whether intrinsic or circumstantial, however I would now expand that definition to include privilege. There are occasions where underprivileged individuals and families move up the social ladder. And there are too occasions where the over-privileged (if we have underprivileged, a term I often use in grant writing and hear often times in social justice settings, dare I suggest that we must therefore have over-privileged) will be forced down to a lower economic class. However for the privileged, these are usually matters of choice, whereas for the poor it is generally a forced status. Why bother with this distinction? To what end rant about economics and class and mobility? Because I am trying hard to love my neighbor and I wonder if talk of downward mobility is a little offensive to them. I recognize that my choice to live on Bachtel in Summit Lake was a choice to forsake living elsewhere, but I often recognize that it was a choice in the first place. I did not move here out of necessity or out of poverty (poverty really being a lack of power and resources). I moved here by choice. My privilege allowed for upward and downward mobility, which is a contradiction somewhat. So when my volunteer group asked about pursuing downward mobility, I cringed a little. It was suggestive that we could choose to be poor. That 'slumming it' was a good choice for up and coming college graduates. And as I pondered their question, I thought of my roommates. One who just received a promotion at his financial investment firm, the other who just purchased a new (well new to him, used) car since he had a new job. Is that not the definition of upward mobility? New jobs, better pay, better vehicles. A better life? And that is what I want for my neighbors. A better life. But a better life together. I would not encourage downward mobility for downward mobility's sake, that is a foolish contradiction. Rather upward mobility together, that is an idea I can rally behind. Because with those new jobs and opportunities, my roommates continue to share with those around them. Their success does not just trickle down to the poor, it is directly shared with our neighbors (sometimes, often times we are a bit too selfish still). Mobility is a real idea. I have witnessed friends graduate and succeed. I have seen neighbors try and try and try and remain unemployed still. Privilege is also a real concept, I have been privileged to have many of the opportunities I have had. I recognize that they were in part of my own hard work, but ultimately the credit lies on the systems that favor people like me (and consequently de-favor people who are different). But it was not mobility that led me to South Street. It was love. And there is no law on love. Love is not restricted to a particular socio-economic class. And as I struggle to love my neighbor (and in doing so struggle with my love for God), I wrestle with the differences of class and cash. But my hope for my neighbor is not poverty, but opportunity. So, good reader, as you too consider these things, I am sure that something above comes off wrong, but if you take anything from my jumbled rant, remember to love your neighbor, and wrestle through what that means. On St. Patrick's Day amidst a sea of green revelers, four representatives of South Street Ministries entered Tangiers, one of Akron's more celebrated and ornamented halls. We strayed into the hall seeking our place with some degree of confusion. We hadn't worn enough green, rather we were wearing ties (a rarity in our line of work/service). A woman redirected us to our correct room, a small hall reserved for the reNEWal Realty group. A group of Christian realtors that meets monthly to discuss, network, and share in the struggle to mix faith and business in the housing market. Duane was their speaker for the luncheon. Duane spoke of his story, of moving into Summit Lake 14 years ago and the start of South Street Ministries, noting the stupidity of his move from a realtor's perspective. After some abstract talk about culture, poverty, and psychology, Duane hit home with the insight that realtors persuade and control some of the forces (for better or worse) of the housing market. Moreover, with this controlling power comes a necessary call to Christian social justice. And it is to this call my writing now turns, I moved onto Bachtel Ave. approximately a year and a half ago to live life with the people there and to serve with them. I was then a single bachelor capable of such a move without much consideration for a wife or family, and I wasn't the only one. However now our group of urban-renewal peers has come to a dynamic crossing: is this the place, the community, the neighborhood, where we set up shop? Do the schools, broken as they may be, become our kids schools? Do the streets, and backyards, and alleyways, and cuts become the paths that we travel daily? Because the presumed answer in the realty market is a "Hell No!" That is if the question is even asked. That is if we even pause to wonder if where we choose to live (let alone that we have the luxury of choosing) is a deep spiritual choice. It is a question that I think we would often rather avoid. And I can't help but ask those same questions as I walk around Summit Lake. When abandoned homes, vacant lots, and broken down properties are discouragingly commonplace, when the school building is closed down so the kids can be bussed to other schools, when young men know more about prison and child support than algebra or history, I can't help but ask why. And I know some of the answers: generational poverty, poor life choices, unfair (and dare-I-say racist) punitive policies, and many others 'reasons'. But I can't help but seek the depths of the question, to examine my own motivations for serving, my own hidden bias, prejudice, and pride. And it is this same question that we posited to a group of concerned realtors on St. Patrick's Day. Will we continue to encourage upward mobility, when our departure cripples the neighborhood we leave? Will we champion security over community? For those of us who are lucky enough (or rather privileged enough, for luck has clearly little to do with it) to choose where we live, will we choose with the Spirit-led discernment that calls us to lay down our lives, love our neighbors, and guard the rights of the oppressed?